Hand-built for the APO (left) and the EMC (right)- 2nd and 3rd place trophies! (sitting atop hand-built Jason Powers shelving). Non-PDGA member, Jaxon Sheehy battled out two consecutive AM-2 (much to the chagrin of his fellow VSVN team members who told him to play AM-1) tournaments this weekend, taking no prisoners. 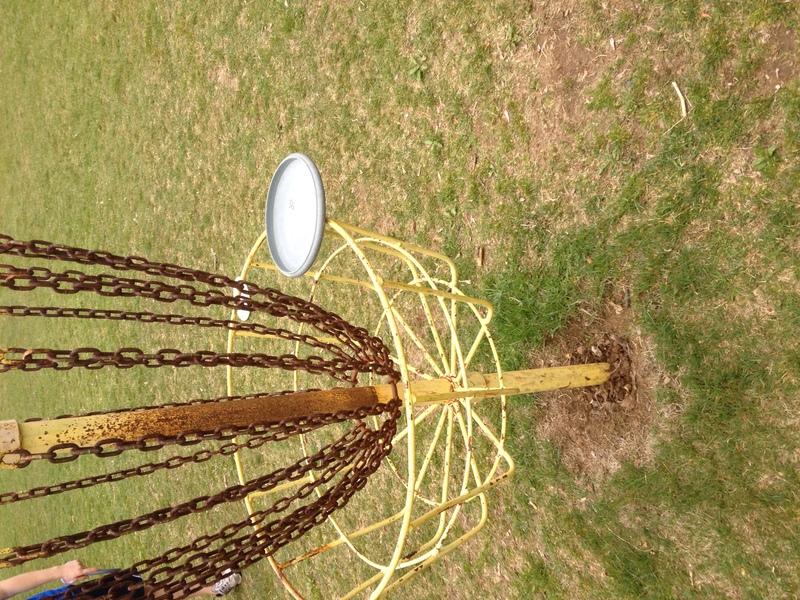 The Amesbury Pines Open was held on Cinco de Mayo, at the tight, technical Amesbury Pines disc golf course. The first round was all roses, as his putting was reminiscent of Josh Anthon, and his drives seemed to pay homage to the buttery smooth delivery of Barry Schultz. This earned him a spot on the top card for the second round. The heavy hitters on the AM-2 top card were chomping at the bit to take Jaxon down (insert sarcasm here), but on their first hole they watched Sheehy throw pin high, to a 390 ft. hole 13 basket (subtract sarcasm here!). This was, unfortunately for Sheehy, the highlight of his front 9. He then missed a 15 foot birdie putt, and proceeded to go bogey, double bogey, bogey and bogey. The final bogey, and icing on the cake came courtesy of the homemade Amesbury basket on hole 17 (see picture of his resting disc!). Demonstrating tremendous poise however, Jaxon went a bogey free -2 down on the final 13 holes of the day. He ended up with a respectable 3rd place. In all seriousness, the winner of the day was lefty, Nick Ligouri who shot an AM-2 best, 49 (-5) to end the day. The very next day Sheehy woke up with the determination of an AM-2er, and drove 15 minutes to his home course of Pye Brook Park in Topsfield, MA just prior to the player’s meeting. Again, he earned a spot on the top card after a decent first round. While his competitors were throwing distance drivers, Jaxon stuck to his bag of CE, SE, and Pro Leopards- knowing that his resiliency and simplicity would only help in the end (insert extreme sarcasm here). When the AM-2 lead card reached hole 5, Sheehy’s favorite hole- in was announced by Sheehy himself, that he had donated a CTP prize for this very location. They then watched him throw off the tee- a backhand, hyzer-flip shot, with a beat up SE Leopard. The disc traveled 300 feet, with a seemingly magical flight path- only to be stopped abruptly by the very top of the bucket. One more inch would have yielded him his first tournament ace, and also tied him for the top spot in AM-2 on the day. In the end, Jaxon fell to Jeremy Thresher by one stroke. 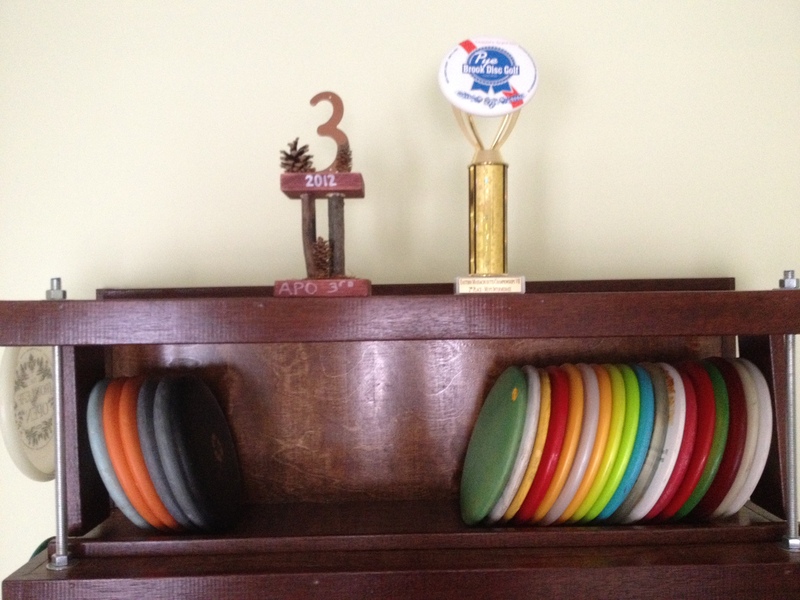 While the weekend did not bring Jaxon Sheehy an actual tournament victory, it did bring him 93 holes of joy, 2 creatively built trophies, 2 t-shirts, 2 tournament discs, a whole bunch of NEFA points- and the overall best score for the May Madness tournament series!!!! (……………….for AM2’ers). The pair of tournaments, put together by VSVN members Dan Ouellet and Bill Stewart, made for the best weekend of disc golf and camaraderie in a very long time. Cheers! This entry was posted in News, Stories and Miscellaneous and tagged 2012, AM2, apo, disc, emc, golf. Bookmark the permalink.